Award-winning author and researcher Dan Buettner has traveled the world to meet the planet's longest-lived people, and learned nine powerful yet simple lessons that could put you on the path to longer life. Where did he find them? In the Blue Zones. Blue Zones are communities where common elements of lifestyle, diet and outlook have led to an amazing quantity - and quality - of life. 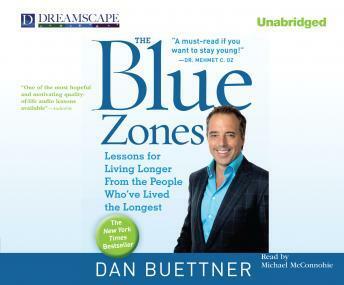 Dan Buettner shares the secrets from four of the world's Blue Zones. Buettner's extensive study uncovers how these people manage to live longer and better, but found in the everyday things they do: the food they eat, the company they keep, and their very perspectives on life. In The Blue Zones, they become yours to follow for life! Once in a while I see a Facebook post about a person who lives healthy and dies young while another person drinks,smokes, and eats junk but lives long. The people who post these types of ignorant messages don't seem to understand outliers. What I love about this book is it isn't about rare outliers it's about real people living life in an enjoyable and healthy way.